We all create routines and add productive habits that help us achieve our goals and live a happier and fulfilling life. We feel determined and motivated to make positive changes in our lives. 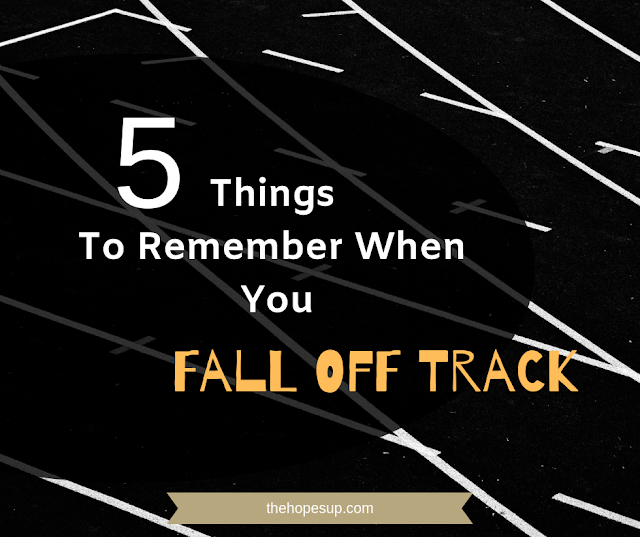 But sometimes we end up falling out of track and fail to follow our routines, because "life gets in the way". We feel guilty and unmotivated. We criticise ourselves and think we aren't capable of sticking to a routine. We feel like our efforts have been wasted. We start beating ourselves up for not being consistent and staying on track. It feels hard to get back to a positive frame of mind and motivate yourself to start again when you can't stay consistent with your routine due to a variety of reasons. 1. There will always be distractions. A lot of things are not in our control and you will have to deal with many obstacles in your life. As a result of which, you will fall out of track at several points in your life. And that is why it is more important that you establish a daily routine which you can follow easily so that you become able to bounce back quickly when you slip up. Don't wait for the perfect moment to get started or follow through with your plans. Because life is never going to be perfect anyway. There will always be distractions, but you must make yourself more resilient and move ahead. You will have to deal with problems that you won't have much control over, and yet affect you in some way. It can be tricky to deal with those situations while focusing on your goals and habits. However, you need to learn to accept things as they are and move ahead despite such obstacles. No matter what, you need to show up and put in the effort, day after day to see substantial changes in your life. 2. Your realization is important. Realizing that you slipped up is the first step to getting back on track again. You are acknowledging your mistake. It means that you accept the fact that you have fallen off track and need to make some improvements in your daily routine. It shows that you truly care and you are indeed serious about achieving your goals. You are determined to make a positive change in your life and get back on track again. 3. It's okay to start small. When you are trying to get back on track, do not pressurize yourself to make big changes all at once. Focusing on little yet consistent changes will make a better impact and help you to stay on track. Doing something is better than doing absolutely nothing. 4. Fretting over your mistakes is only going to waste more time. Beating yourself up will only waste more time. It's okay if you had a slip-up. It happens to everyone. If you beat yourself up for falling off track, you will only discourage yourself. Instead, you need to motivate yourself and tell yourself that it's okay. And then take the necessary steps to start your routine once again. By fretting over your mistakes, you're actually making excuses to not continue with your routine. Your mistakes are in the past. You have a chance in the present to make a positive change and get back on track. Don't miss this chance or otherwise, you will end up in a vicious cycle of regret and guilt. 5. Every mistake teaches you something about yourself. Falling off track can be a useful way to learn about your behaviour and what causes you to skip your routine. You learn what works and what doesn't. Observe how you react when you slip up, what leads to it and how you can stop yourself from getting into that pattern again. If you can get to the root of your mistakes, it will get easier for you to bounce back. You will learn what makes you vulnerable and what you can do to avoid triggers that make you lose focus. Your will to resume should be stronger than the desire to give up. How do you make sure that you stay on track and follow your routine every day? Share your thoughts with me in the comments below. And, if you found this post helpful, don't forget to share it. I love number one, especially, “You need to show up, and put in the effort.” When other people do not agree with my decisions, or I don’t get the support I want from people close to me, I really struggle with that. I don’t like to let people down, and I want approval from others. I recently made a big decision about my job, and things are going to be uncomfortable for a couple weeks, but I guess this shouldn’t come as a shock! I still need to stay the course, and take care of my business. Thank you for the encouragement, it is always helpful and needed! I totally get it! I struggled with seeking approval from others as well. Eventually, I realized that I can't control what others think about me. So why worry about it! I'd rather focus on things that I believe will bring me happiness without worrying about other people's opinions. I'm so glad you found this post helpful! Thank you so much for your comment, Rebecca!